There's trouble bubbling up in Bikini Bottom, King Neptune's crown is missing and Mr Krabs has been accused of stealing it! Together with his best pal Patrick, Spongebob sets out to treacherous Shell City to reclaim King Neptune's crown and save Mr Krabs. Who says traditional hand-drawn animation is dead? Done the right way and there will be kids out there clamouring for it still. And so who is aware of a cute piece of yellow sponge that moves, talk and with a heart of gold? I’m sure most kid and adults are aware of this innocent, cute Nickelodeon’s character: Spongebob Squarepants. For those who are not followers of the regular cartoon episodes, here’s a quick intro…Spongebob resides in a pineapple-like house at the bottom of the sea in a place called “Bikini Bottom”, works in a fast-food restaurant called Krusty Krab, has a best friend called Patrick (he’s a starfish actually) and how can any animation do without an evil-doer? His name or should I say it’s name is called Plankton. 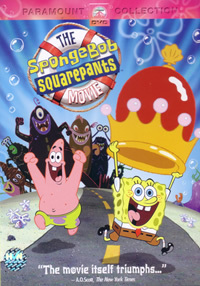 In this movie, Spongebob and Patrick has to travel to the perilous Shell city to find the King Neptune's crown before his boss, Mr Krabs is burnt alive for stealing it. No prizes for those who managed to guess who’s the culprit who framed Mr Krabs. Fortunately, the extension to a full-length feature did not deter the filmmakers from going easy on the usual charming “mo lei tau” humour. To make a comparison, the Spongebob’s humour is very close to Stephen Chow’s brand of well-known comedy antics. In fact, Spongebob and Patrick is as good as Stephen and Wu Meng Da. Out of nowhere, there will be a sudden spring of crazy dialogue sparring or some song routines that will make you insane or burst out in laughter. To add on the fun, look out for David Hasselhoff cameo as the helpful lifeguard, Alec Baldwin and the gorgeous Scarlett Johansson as Princess Mindy. There you have it. Never mind the fact that you might not totally comprehend the whole scenario or the bunch of bizarre characters. Most importantly, just let go of yourself and immersed in the wacky, zany antics of Spongebob and his friends. Everyone! We're all Goofy Goobers, yeah Goofy, goofy, Goober, goober, yeah! The Absorbing Tale Behind The Spongebob SquarePants Movie (18.14mins) - This feature consists of interviews with the talented voice actors such as Tom Kenny who voices Spongebob and also director Stephen Hillenburg. Listen to their enthusiastic interviews and simultaneously, this segment is also good for brushing up your vocabulary, learn the meaning of words such as "Dolt" and "Rapacious" as they flash on the screen. Case Of The Spongebob (14.49mins) - An educational segment with Jean-Michel Cousteau, (son of the late ocean explorer Jacques Cousteau) introducing audience to the marine world. See a real-life starfish and squid in the oceans as compare to their cartoon counterparts. Saving The Turf (03.36mins) - A short message from the Surfrider Foundation reminding you to protect the ocean and do your part in beach preservation. Animatics - An introduction of the rough sketches of the drawings before they are fully animated on the screen. Teaser Trailer - The cute teaser trailer which are put together with shots from movies such as "Das Boot", "The Hunt for Red October" and "U571". The fun in having three languages here is that you can switch to Thai and Korean for subsequent viewings. Presented in Widescreen 1.85:1, there's no apparent artifacts spotted, colours are bright and overall transfer is excellent.